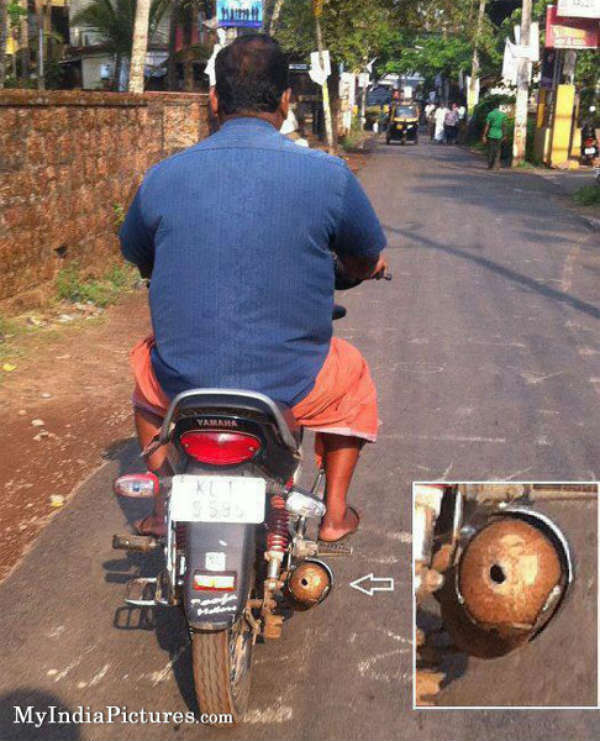 India is a country which runs on Jugaad. You can see a lot of them in our day to day life. 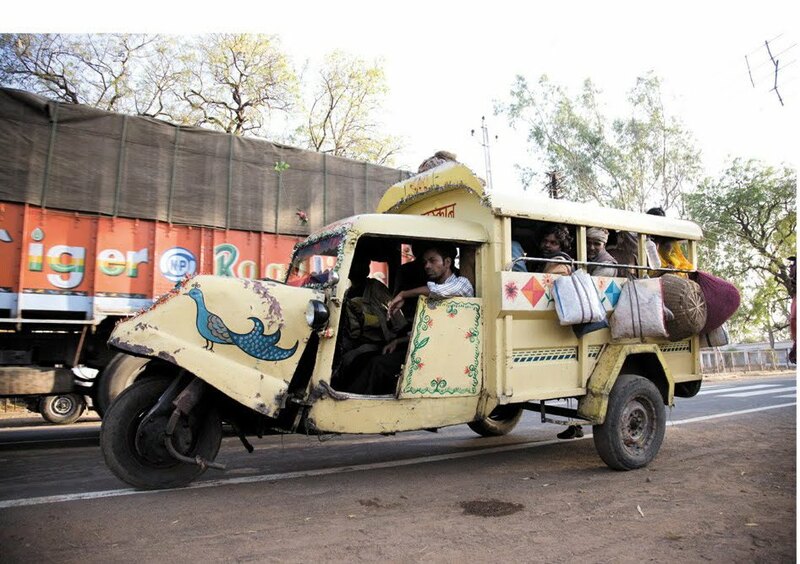 Here are 10 such Jugaads related to the automotive sector. If you have had an accident and the boot of your car is damaged, what would you do? Get the boot changed right. But if you don’t want to do that, you can always put a lock on it so that it doesn’t open. This is how innovative we are. 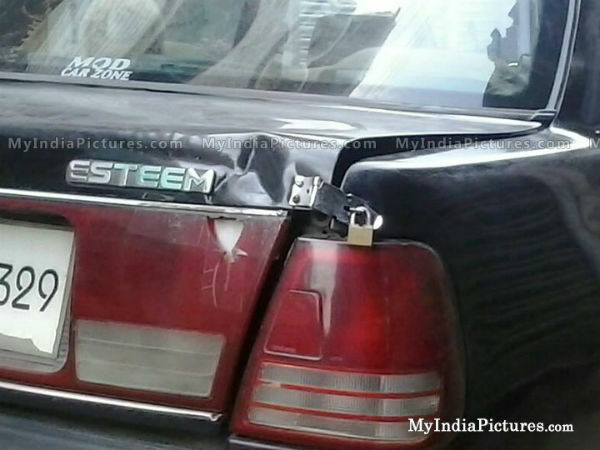 Since car safety has been a topic of discussion lately, this driver has taken it to an all new level. 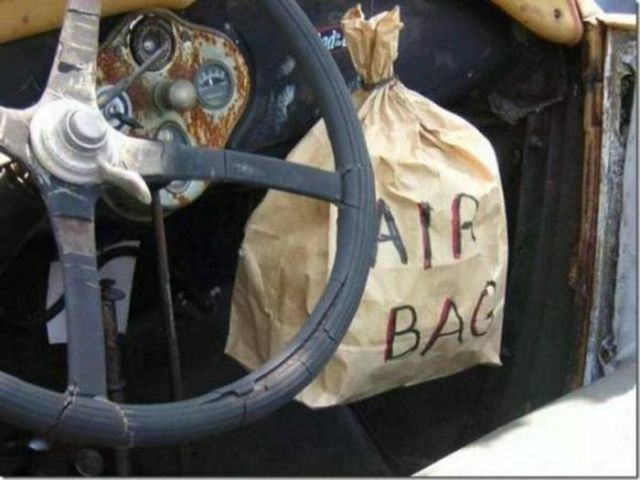 Since he couldn’t get an aftermarket airbag for his vehicle, he has resorted to another more literal form of the air bag. Even though a bike is only supposed to seat 2 people, it is very common to see 3-4 people seated on bike. 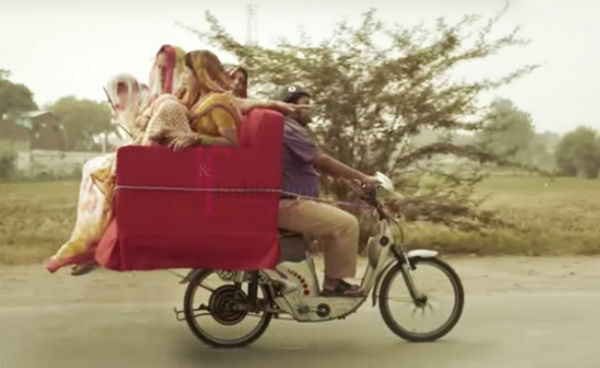 But if you want to transport more people, all you need to do is add another wheel at the back and you have an extended bike, just like in the movie ‘Golmaal’. It is common for the exhaust system on a vehicle to get damaged over a long period of time due to rusting. So what’s the best fix? 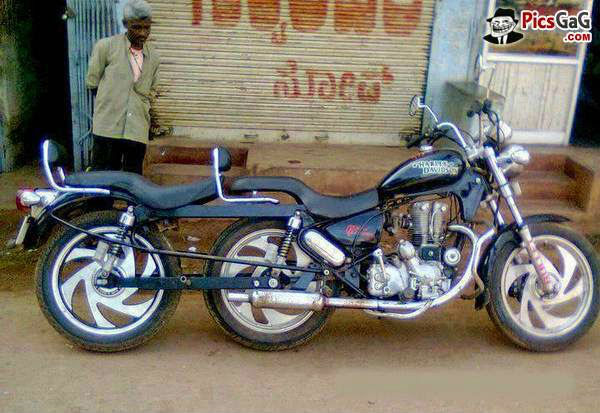 Well to put in a coconut as a replacement for the muffler is the best way to do it it seems. Have a bike but want to be protected from the sun? Well here is the best solution. 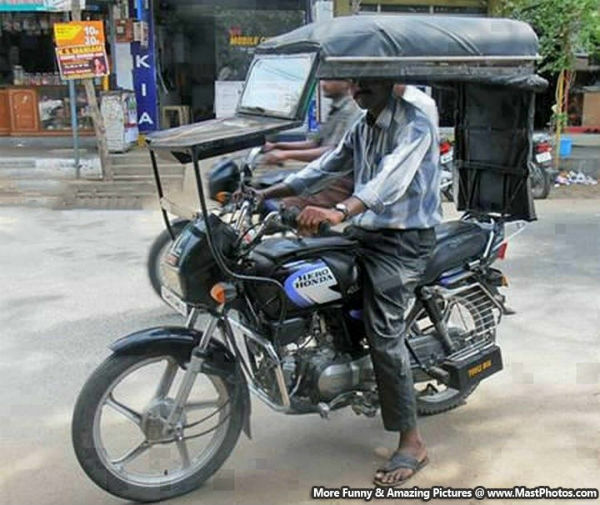 Have a front windscreen and a plastic/fabric roof installed on your bike and you are all set to be protected against all the other elements. What do you do if your tractor has gone for service you have to continue ploughing the field? Attach the plough behind your SUV and you are all set, as can be seen. Here is another example of carrying multiple people on a scooter. The owner has attached his sofa to the rear of his scooter and now can easily transport 4 more people along with him, in total comfort ofcourse. The Jugaad is a type of transport carrier used in the rural areas to transport goods and people. Here, you can see how the vehicle is transporting so many people as well as their luggage. 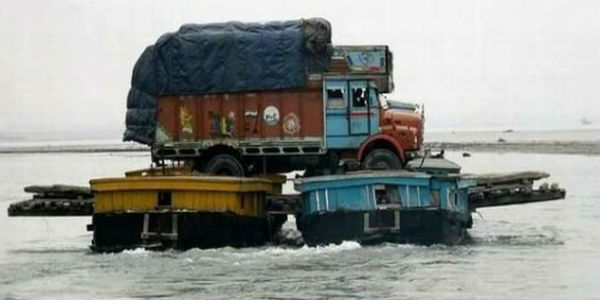 Transporting a large truck without a proper ferry across a water body is a tough job. 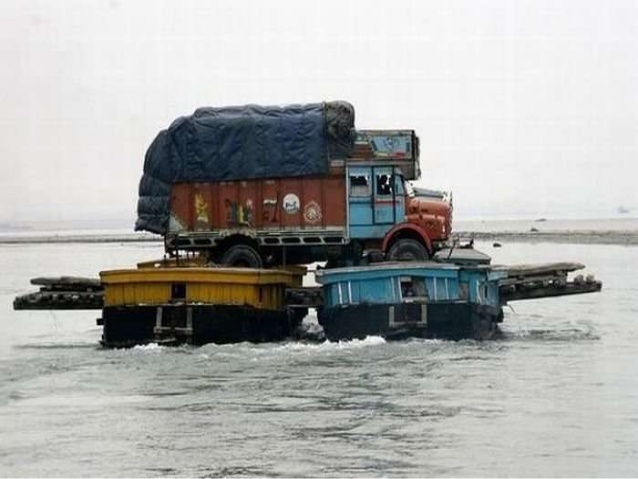 However this person has managed to put two boats together and make a temporary ferry to transport the truck across. Great dedication. The best way to get people to move out of your way? 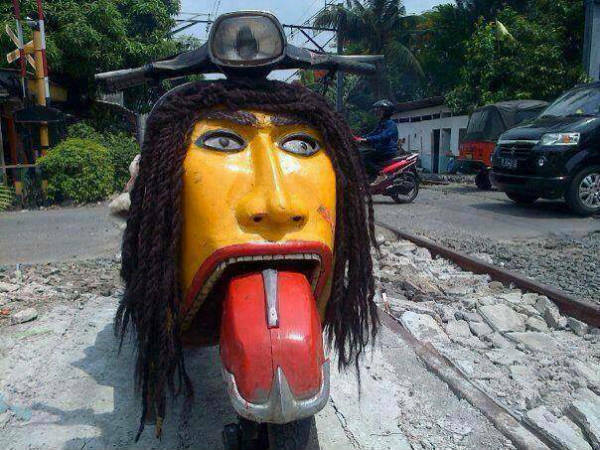 Redesign the front end of your vehicle to look like a demon and we are sure you will be able to ride/drive without being disturbed.